This Version does not exist any more. There is a new System 2 now. Why that? Are'nt there appropriate solutions out there? May be this solution is a little bit special because of my situation. I don't own a car and therfore I cannot carry large studio flash equipment or even 'porties' with me. Everything has to fit into my bags and thus the whole stuff has to be very compact and light weighted. So I decided to buy a little zoo of SB-80DX flashes and control them remotely. One SB-800 I already had. With my RF solution I not only can trigger the flashes, additionally I can control power, wakeup from standby or let them work as stroboscope. 'Ready' signal is processed so that the receivers will tell me when all flashes are ready to trigger again. 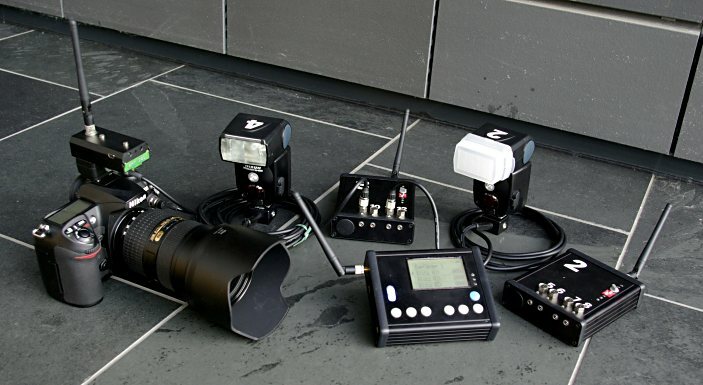 The flashes are connected via cable with AS-10 heads to the flashes. 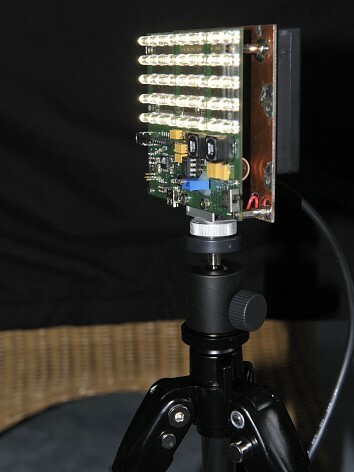 Four 3,5mm phono jacks exhibit connectivity for non-Nikon flashes, but these only can use the trigger and quench signals then. My system consists of a transmitter, plugged onto the camera, three receiver units (could be seven) and the controller unit. The system is based on 433MHz RF modules. Although there is lot of other stuff working and disturbing in this frequency range I decided to use them because of there extremely short latencies. Short latency was important for me to get realy fast synchronisation response time. My system can trigger the flashes even in a 1/250 second window! The system provides seven channels plus one broadcast channel. It can address seven receivers (plus one address for all receivers). 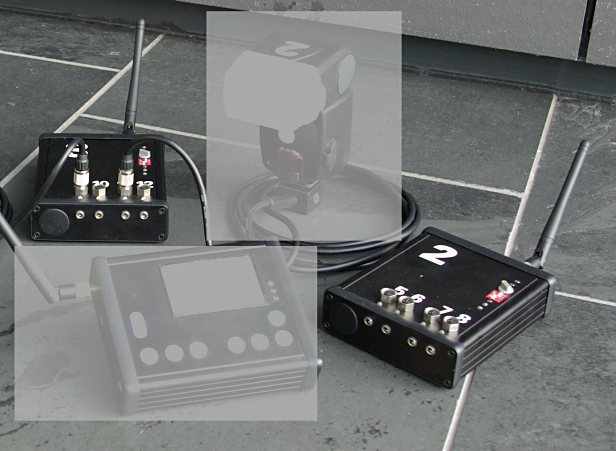 Each receiver can control four flashes, 28 in total. The power of every single flash can be configured individually. Rf transmission is hamming coded. Although no error correction is provided, errors can be detected so that theoretically no unwanted trigger pulses can occur. By the nature of this RF technique missing triggers cannot be avoided. All units are powered from Nikon EN-EL4 batteries, so power should'nt be an issue at all. Additionally all batteries are protected against under voltage discharge. 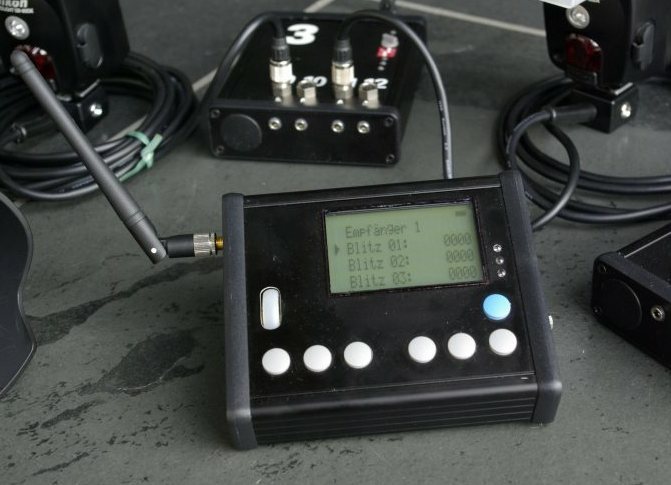 Besides the receiver and controller units contain battery chargers which can be fed by any power supply with output voltages between 6...12 Volts. The transmitter on the camera triggers the flashes fast enough to catch even a 1/160 sec window. 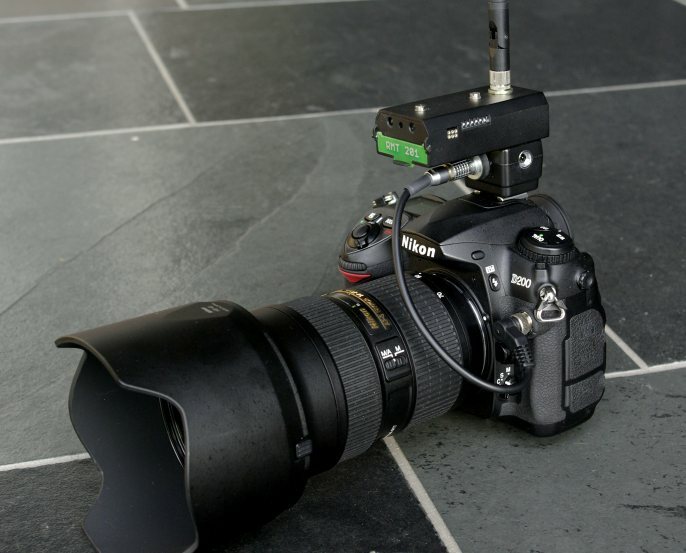 If the transmitter is connected via a little adapter cable to the remote connector of the camera, the synchronization time may be even as short as a 1/250 second. This works by detecting the first push point on the camera shutter release button (focus button), which activates the radio link early enough to get nearly latency free triggering of the flashes. Three powerful LEDs on the transmitter front provide an additional focus support light. Not that powerful to focus on far objects but powerful enough for portraits. This is just helpful in situations where the focus light on the camera is covered by the lens hood or just accidentially by a fat finger ;-). This focus light is immediately switched off when the camera shutter release button is pressed to it's second push point, preventing this light to be visible in the photo. There is a second more powerful method for helping focus to lock in dark ambience where the camera would not focus any more. On each receiver one flash can be set into a 'FHL' (Focus Help Light) mode. This will set one 'FHL flash' into a fast pulsing mode. This FHL function is triggered by the focus point on the shutter release button and activates the FHL flash just for a short configurable time to let the camera catch the focus. Certaily this feature works best with fast AF-S lenses. For slow AF-motor driven lenses this FHL may need two or three repetitions before the focus locks. Clearly this FHL mode can stress the flash a lot and should only be used when there is no chance to focus without. For the future I plan to develop a more powerful FHL light based on white LEDs so that I don't have to use flashes for that feature any more. By the way the FHL light is quenched immediately if the camera is triggered so that the FHL flash will not contribute to the photo illumination. Every receiver controls up to four flashes. Power can be set individually for each flash and all settings can be stored in the receiver so that all settings are available on power-on again. If there is no configuration data stored in the receivers, the flashes will initially configured to maximum power at startup. This ensures that flashes will work manually, even if no controller is available. 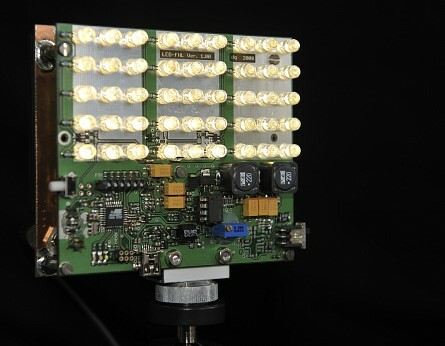 A stroboscope mode can trigger the flashes up to 15 times automatically. The minimum interval starts at 20ms while the maximum interval lies at 5 seconds. Unfortunately at the moment my system is not able to calculate stroboscope parameter settings depending on battery power and flash power but may be one day ... we'll see ... the receiver may be able to calculate and warn if settings are too tight. As the receivers can beep on certain events, it is configurable on which events the units should beep. At least all beeps can be switched off completely. In certain situations it may be desireable to prevent flashes going into standby. So, just tell them. And completing the receivers as 'egg-laying-wool-milk-piggs' they can be configured as remote control units for the camera as well including the abillity to activate focusing before triggering the camera. Thus the receiver can emulate the release shutter button for both focusing and triggering. Now, there is another unit ... the controller. With this unit the flashes can be configured via the receiver units. On an LCD display one can select the desired flashes and set them as required. The flash list contains 28 units but you can configure this list to less receiver units to have a more compact list. To every flash one can assign a profile which at least contains a lockup table to convert binary power values into the common photographers representations like 1/8 +(1/3) or 1/32 -(1/3). Without profile the numbers on the display will look like 0000 ... 8191. Additionally the profile data may contain minimum and maximum power capabillity data or minimum interval time data for the FHL and stroboscope feature. By the way, setting power to 0 will just switch off the flash completely. A mouse wheel makes it easy to scroll through flash lists or setting values, like power, stroboscope and all the other features. As the receivers do, the controller can store all data, too. There is one standart user profile for often used settings and there are four dedicated user profiles where explicit settings can be stored. All stored data can be transmitted to the receivers with a single command. Above show is the LED focus help light. It will switch on immediatly as you push the camera trigger half way down and stay on for adjustable one to four seconds. Only if you press the camera trigger full way the LED FHL will immediatly switch off again so that the FHL will not contribute to the foto.